The vote to leave the EU against remaining was made by 52% of all voters (it was a total vote, not number of Wards). These ward-level voting results are published on www.bbc.co.uk/news/uk-politics-38762034. It should be noted that it represents a good proportion of wards, but not all of them. This data is combined with demographic values from www.lgbce.org.uk. To see which variables are helpful for classification of voting leave or remain, we ran analysis through logistic regression. We could have used linear regression to try and predict the leave/remain numerical vote outcome of any ward or set of demographics whhich could still be used to see if over 50% therefore indicating a binary decision to leave or remain. We were successful in creating a model which could predict 94.8% of the vote to leave, based on the basic profile and demographics or any ward, which is an excellent result. The bigger the voting turnout, the more likely remain won the vote. The higher the population density, the more likely remain too. As age increased, the more likely a leave vote was passed. Level 4 and above qualifications (ie from Diplomas and upwards) were less likely to vote leave. Apprentices were more than twice as likely to vote leave (together, to a lesser extent, those with Level 2). Mixed.White.Black.Caribbean were more likely to vote leave, whereas even more likely were Mixed.White.Asian, Other.Mixed and to a lesser extent Chinese to vote remain. White.Gypsy.or.Irish.Traveller were substantially more likely to vote leave, but not enough data confidence to confirm the opposite vote from White.Irish. Arabs were more likely to vote leave, together with Other.Ethnicity. Not as significant (but greater in number) is that White.British were more likely to vote leave. PT.Self.Employed were likely to vote remain, followed by Students.Economically.Inactive and FT.Employed. Whereas FT.Self.Employed were more likely to vote leave. Economically.Inactive.Other and Economically.Inactive.Disabled were also likely to vote leave. Shared Ownership voters are likely to remain, which also applied to Private Renters. Owners with Mortgages and Social Renters (eg council tenants) were both more likely to vote leave. Those in Fair Health were the only grouping likely to vote leave – all other more extreme groupings were more likely to remain, significantly so for both Very Bad Health and Very Good Health. Voters with ‘no religion’ were likely to vote remain, followed by Hindu’s, Muslims and Buddhists. All other faiths were non significant at voting either way. For each of 1,030 Ward level counts, there are 63 demographic variables. Records are clean, we just need to compute any ratios and remove any incomplete data. brexitvote <- subset(brexitvote, select = -c(Mean.Age) ) # Median usually slightly higher but close and only need one. A quick look at the structure of records. By summarising the values we can also check for outliers – of which there are none. Let’s check the key variable frequency distributions. 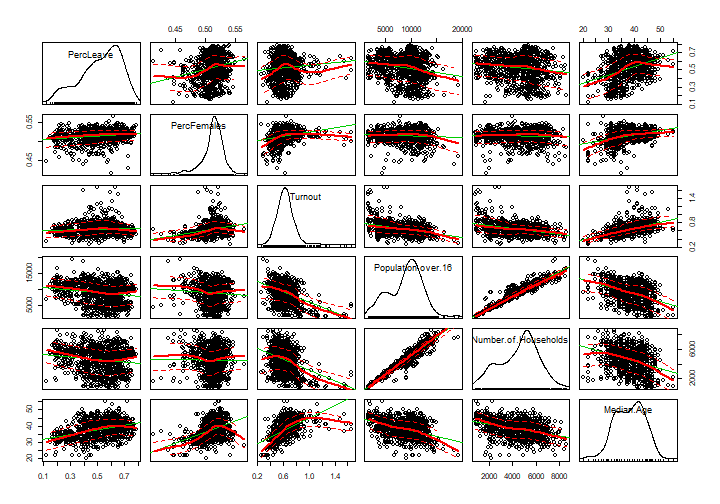 We can see that although all these variables are right-skewed (tend towards the bigger values) they are all uni-modal and have no large outliers so can be considered as normal. If they were standardised into z-scores, they would be centralised along their average means and even more balanced. Let’s check correlation (without the splits of Education, Race, Employment, Home Ownership, Health or Religion). We can see the relationships are fairly centralised regarding the Percentage Leave vote which the outcome is based on, so no obvious influences. We can see the confidence intervals tighten to improve in the mid ranges of the variables, which is expected. As we have a good number of cases, we needn’t worry about the widening intervals at outer ranges. Unlike linear regression, logistic regression is not so sensitive to its data being normally distributed. The model is fitted using binomial logistical regression with a logit link function. We need to remove our percentage of leavers becasue it’s collinear with the final Outcome (Leave or Remain). Then we can check residuals – as mentioned, it is not a prerequisite to have normal distribution of error differences. These residual plots show the familiar patterns of logistic regression (due to the binary nature of outcome response) so are acceptable. Now we can inspect the model statistics. Logistic Regression does not have an R-Squared value to indicate cover of true response variability, so is more difficult to verify goodness of fit. Coefficient estimates (weighting of influence) are based on the outcome response of voting leave (the majority). They’re measured in log odds (aka logit) and are not as simple to interpret as many analysts believe. The baseline is 1 which represents no change, whilst 1.5 would represent “one and a half times more likely”. However, these positive numbers can increase right up the scale. Note, when we say something is “significantly more likely” we don’t mean that it’s culturally significant or even more likely in comparison to other factors (unless stated specifically) – by “significantly” we mean the observation is significantly unlikely to occur by chance, ie we can be more confident that it is a true statement about the data. Also, we can only talk about particular groups being “more likely” to vote one way, but this is a geralisation, because ultimately we only have counts by ward, not individual observations. So in such cases we are effectively saying that a ward is more likely to vote one way given a higher proportion of that group, with all other variables held constant. Let’s check the significance and effect of the non-demographic variables. To help interpret the coefficient Estimate, we can convert it into an Odds Ratio. All factors are highly significant, with the highest effect from Turnout – the bigger the voting turnout, the more likely remain won the vote. The higher the population density, the more likely remain too. As age increased, the more likely a leave vote was passed. Turning to the demographics, we’ll keep them split to focus estimations within the groups, otherwise they get watered down. Note the NAs (and “1 not defined because of singularities”) result from each grouping at ward level adding up to 100%, so each last remaining group category is effectively collinear. We can remove them but they have no effect on the model coefficients or summary statistics and keep the groupings and category names clearer. From this result, it appears highly significant that Level 4 and above qualifications (ie from Diplomas and upwards) were less likely to vote leave. Apprentices were more than twice as likely to vote leave (together, to a lesser extent, those with Level 2). We should be careful of which group is the baseline reference group, because if, like in this case, the last group is chosen, it is likely to be the smallest group, which then inflates the influence of the other groups. Generally, the largest group should be chosen for the baseline, however this is often one of the contentious groups we want visibility of. We will use a mid-range group here – Level 2 qualifications. We can see it remains highly significant that Level 4 or above is even more likely to vote remain. This regrouping has allowed the “No Qualifications” group to seen as significant and in fact all groups apart from Apprentices contribute to the vote to remain. For race / ethnicity, we’ll choose the non-extreme “Other White” for baseline – it’s still minority but the next largest grouping. ## White.British                    0.0872     0.0486    1.80   0.0724 . Most significant (data confidence wise) is that Mixed.White.Black.Caribbean is more likely to vote leave, whereas even more likely are Mixed.White.Asian, Other.Mixed and to a lesser extent Chinese to vote remain. However, Other.Asian are more likely to vote leave, so that could combine with the Mixed.White.Asian to even out. White.Gypsy.or.Irish.Traveller are substantially more likely to vote leave, whilst there’s not enough data confidence to confirm the opposite vote from White.Irish. Not as significant (albeit greater in number) is that White.British are more likely to vote leave. Arabs are more likely to vote leave, together with Other.Ethnicity. For Employment status, we use PT.Employed as baseline. PT.Self.Employed are most likely to vote remain, followed by Students.Economically.Inactive and FT.Employed. Whereas FT.Self.Employed are more likely to vote leave. Economically.Inactive.Other and Economically.Inactive.Disabled are also likely to vote leave. For home ownership, we use Home.Owned.Outright as baseline. Its most highly significant (data wise) that Shared Ownership voters are likely to remain, which also applies to Private Renters. Owners with Mortgages and Social Renters (eg council tenants) are both more likely to vote leave. Fair Health is used as the baseline here. It seems that Fair Health is the only grouping likely to vote leave – all other more extreme groupings are more likely to remain, significantly so for both Very Bad Health and Very Good Health. No Religion is convenient to use as baseline here. It seems most highly significant that those with ‘no religion’ were likely to vote remain, followed by Hindu’s, Muslims and Buddhists. All other faiths were non significant. The most important test of model is whether it can predict at least or preferable better than the original outcome (without first being given that value). Let’s use all the variables in the model. Then use the model to predict the outcome (Leave or Remain vote), and use a Confusion Table to tabulate the results. We have an overall accuracy of 94%, which is very good (especially considering all the factors which make somebody vote either way). Note that this accuracy statistic can be misleading for non-equal category sizes, which most data is, but considering the vote outcome was close at 52% Leave, our accuracy here is pretty impressive. Now we’ll split the dataset into training and validation, and only give the model 70% of the dataset to train on, leaving the other 30% for it to predict. The accuracy on the training set is 93.6% which is good and close to the original. Sometimes this can go up or down (latter more likely as less data to fit to) and this is a good reason to perform Cross-Validation where we give it different samples, as we will see later. The accuracy on the validation set (whose original ward level records the model has never been given so it is completely new to it) remains high at 94.8%. This is unusual, being higher than the training set, but is just good luck with the 30% of data it was given to validate. The model is better at predicting True Positives (Sensitivity / Recall) than True Negatives (Specificity). We would always like to improve the model by giving it as many test cases as possible, yet we don’t want to give them all at once otherwise it will overfit the model – ie become tuned to the exact data rather than underlying correlations, which would make it worse at predicting new data. So let’s use a cross-validation tool to split the data into K-fold (eg 10) datasets for resampling. Note the accuracy corresponds to our earlier model. The Cohen’s Kappa shows the ratio of difference between actual and chance agreement of predictions, with 1 being perfect and 0 showing no better than completely independant agreement. This 83.6% is a good indicator of definitive prediction. If we provided less predictors, we can see the accuracy and Kappa statistic reduce. We can shorten the output whilst including Standard Deviations. We have seen that logistic regression can both predict voting behaviour from ward information and demographics, and also pick out deeper demographic voting likelihoods, and use this to build a profile of type of voter.